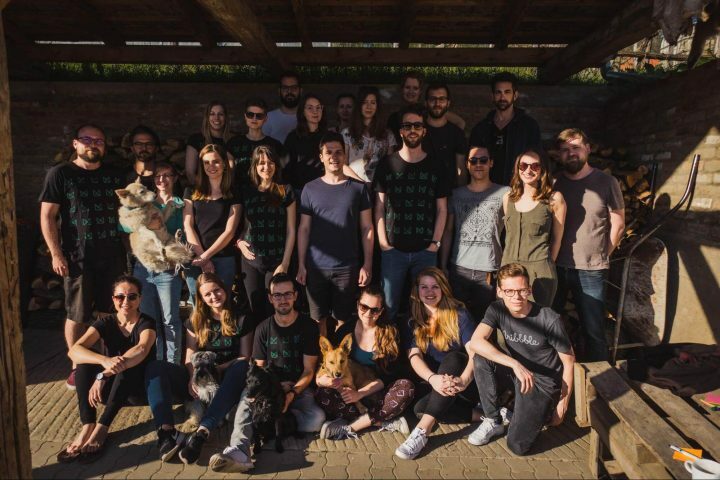 Every six months, our whole UX team travels to a remote location in Hungary’s countryside for two days to have fun and decide together about our big goals. 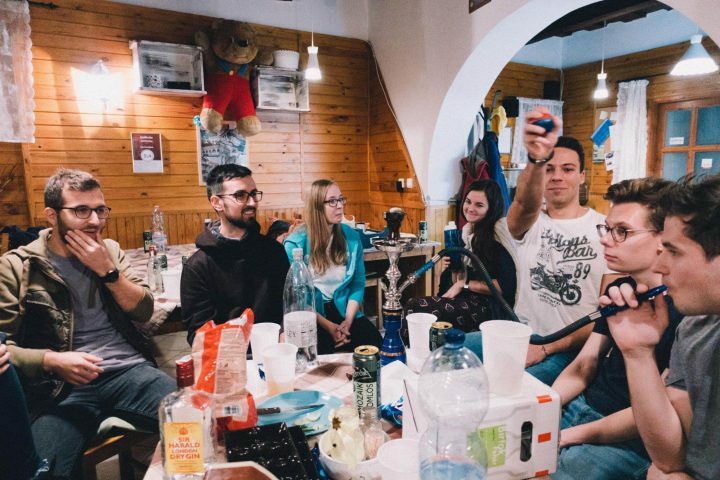 These team building retreats play an important part in UX studio’s culture. We have been doing them for five years now, and we love them dearly. So, after ten of them, I’m sharing my learnings and giving tips to those of you just starting out with the corporate retreat concept. Why travel far away to spend a whole weekend with co-workers? People get energized, ready to return to work, and to do it even better. Everyone feels more connected to the team, sharing common stories and memories. A common understanding of identity and goals develops. A retreat provides time unavailable during day-to-day work to discuss things. Team members can provide many insights and many new ideas to you as a leader. Some people might find it weird to travel and spend days with co-workers. They will probably change their minds after their first retreat. 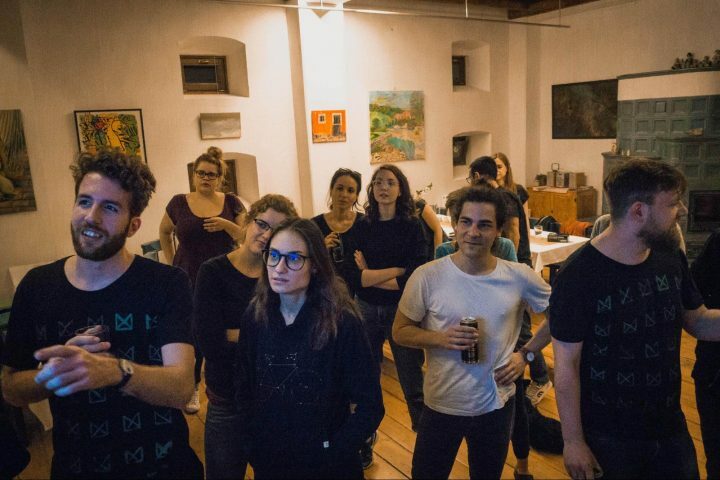 At first sight, it looks easy to organize a team retreat: book a venue, organize travel, and come up with some fun or more serious activities. But the devil lies in the details. Many small things could make or break a retreat. As we did more and more retreats, we realized how those details hold the key to a great event. Do a retreat when your team has lost its energy. Go when you have to make important decisions, you face major challenges or your team starts a new chapter in their work. We go on a retreat every six months because this frames the time when teams need refreshing and we have to shake things up. That I often feel we have lost focus and the daily work has drained us before the retreats indicates the appropriateness of this interval. My first rule: A retreat has to last at least two nights and two whole days. Each night plays a different role. During the first evening, the team will feel excited and will enjoy being together. By the second, people will know each other better, allowing for calmer, deeper discussions. Although we usually go for two days, I really envy teams who go for a whole week. We will try that one day at UX studio. For a start, this definitely suffices. UX studio is a UX design company. To find out more about the UX process, download our free ebook Product Manager’s Guide To UX Design! Where should we hold the retreat? The second important rule: Go out of town. You cannot hold a retreat in the office (no, seriously; a retreat means going away). You can’t hold a retreat a few blocks from your office, either. Going away will ensure no one will just come and go. It will provide an opportunity to explore a new place together and with it, a new perspective. It will help physically distance yourself from your daily job and look at it from above to see the big picture. The venue matters a lot. We like remote places with beautiful nature around. Somehow, I can’t really imagine a retreat in a huge city. Who knows, we might try it one day. It requires a big room where the whole team can come together, and also many different spots where smaller teams can hide away to discuss things. 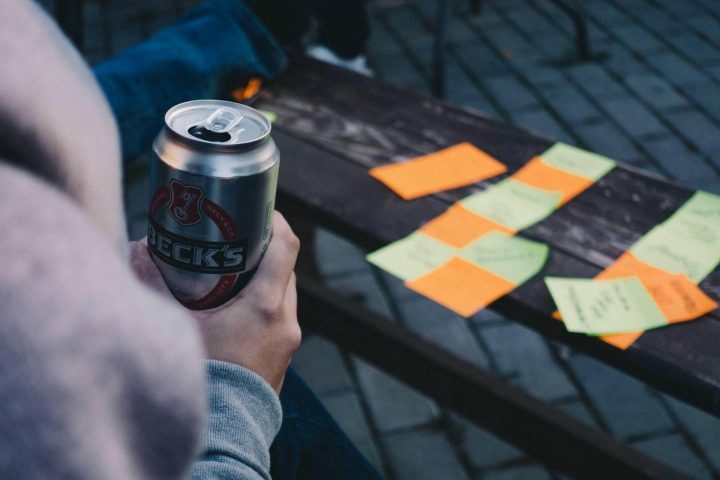 We like to hold these workshop discussions outside in a garden or terrace. Once we did workshops on a high school basketball court. For a long time I thought retreats meant making serious decisions and crafting great plans for the future. Later, I learned to value the fun part more. In his book Shoe Dog, Nike founder Phil Knight shared some memories about team building retreats they went on with his executive team. They spent a few nights in resorts where they got drunk most of the time, laughed a lot, and discussed many business issues in the meantime. They called themselves and these occasions buttheads. Booze needn’t play the most important role in your retreat, but a light, fun mood can help. People will remember that way longer. And it will strengthen the bonds in your team. Over the years, we have tried many tricks, but at the end I just admitted that only about five or six hours of serious work can happen during a two-day retreat. That can suffice if you organize it well. This makes planning the team building retreat program important. One can easily say “OK, we will discuss this on the retreat too”, but in reality, you have quite limited time. How to plan your retreat activities? Start the retreat with the fun. 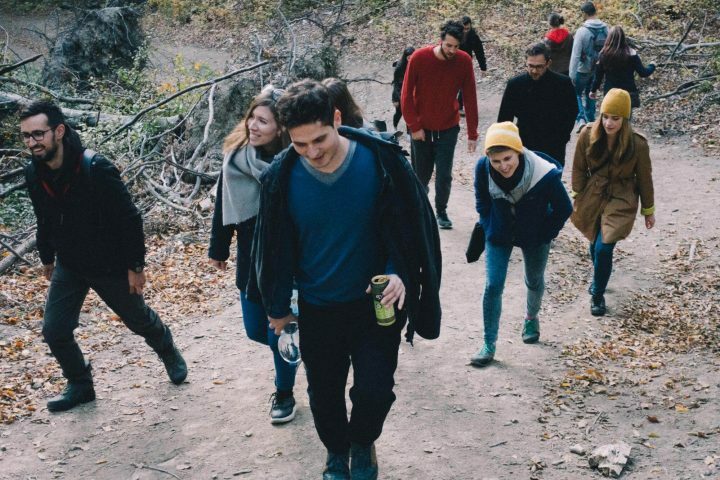 As we say “mobile-first” in design, we can say “fun-first” with retreats. It will help you break the ice and relax, especially when arriving after a week of hard work. As mentioned above, value the fun activities just as much as serious workshops. You can do anything your team likes, from throwing a party to playing games or doing sports. In my experience, different companies like different things. 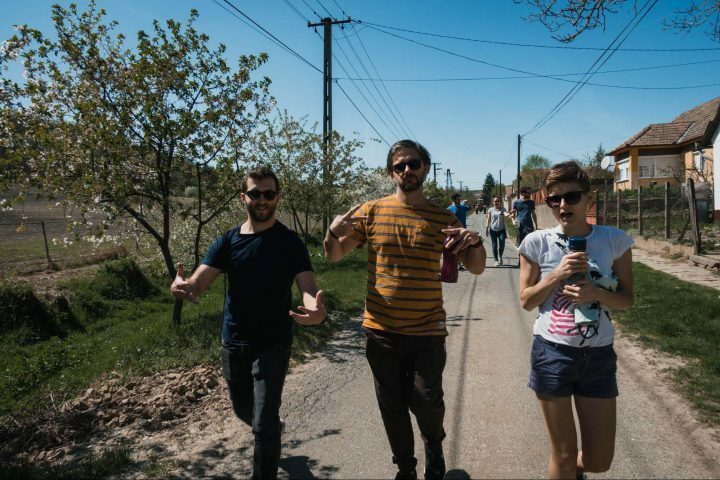 For instance, many people at UX studio enjoy hiking and going out into nature. So we often hike during our team building retreats. We also really like board games. 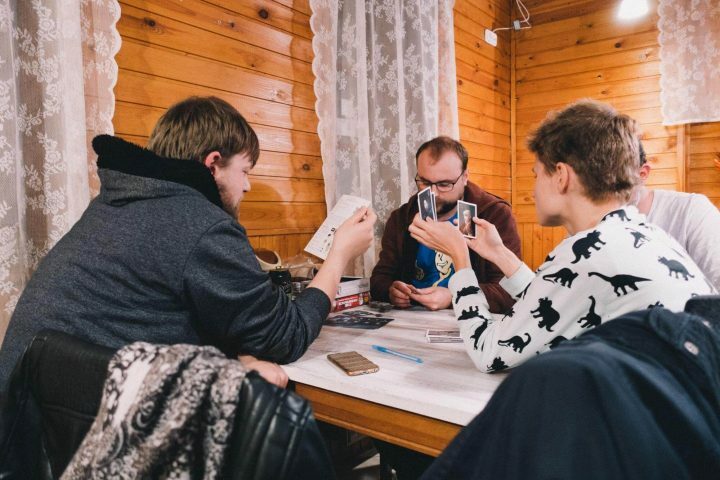 Last spring’s Cards Against Humanity session was epic! Your team might prefer dancing or creative stuff, maybe a movie night? Trust them and just do the activities they like. Among other things, we played sports (from ping-pong to basketball), or played guitar and sang together, or went to the bath/spa, pub tour, boat trip on a lake, etc. Definitely coordinate the first couple of team building retreat activities after arriving. The unfamiliar situation of arriving at the retreat can make everyone feel a bit uncertain. Later, give them more free time so they can do random things too. If people enjoy something and refer to it as the highlight of your retreat, make it a tradition. In the early days I found traditional team building games boring and thought everybody hated them. Then one night, Bence, one of our great designers, organized an activity called the “UX Cup” in the office after work. This team competition involved different tasks spiced up with some UX flavor. People simply LOVED it. From that night on, we have done it every time. All in all, make sure to include plenty of fun, but leave time for serious work as well! 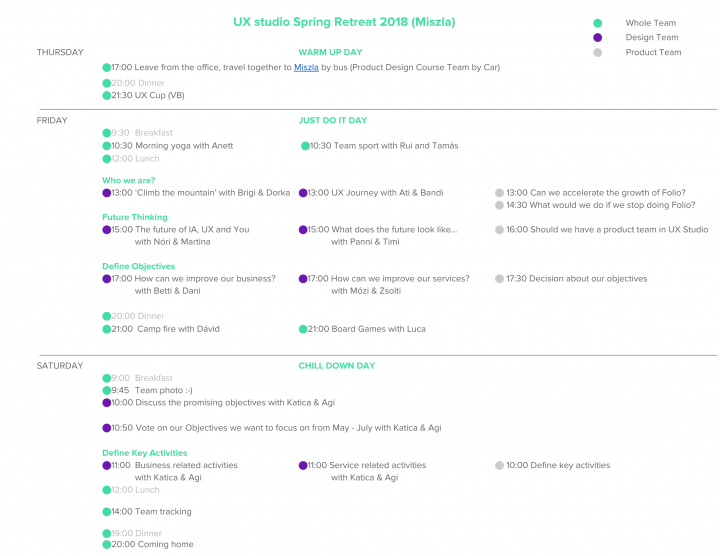 How to plan workshops for company retreats? After the fun part, do a few warm-up workshops. We group these into two categories: “Who we are” and “Future thinking”. During these workshops we get to know each other better and try to find our common values. Small-group discussions on how we wound up as designers became my favorite. It turned out most of us don’t have formal educations in the field. We started in many different areas, but we all turned to design because we love it. Understanding this common history explains this team’s existence: we came here to design, because we love doing it. It might sound obvious to outsiders, but this realization gave me a new perspective about the team. Building a timeline of the company’s history also proved fun. Everybody added the best moments they remembered. It brought so much joy, and we laughed a lot. 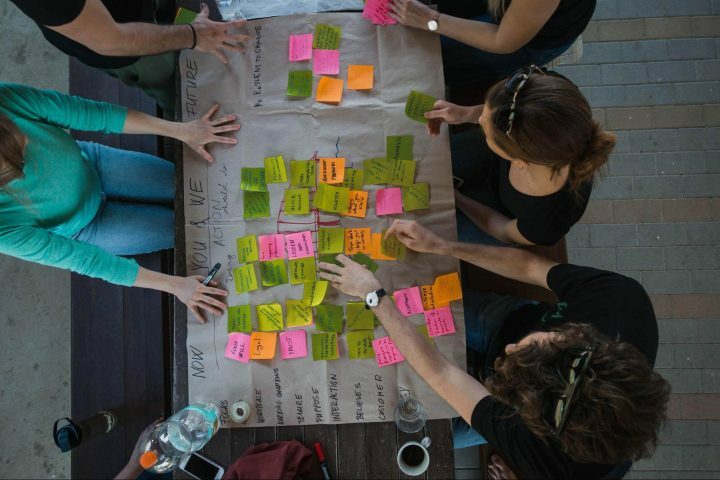 During these workshops of team building retreats, we try to imagine our long-term future together. The budgeting workshop has become my favorite of this type. The facilitator asks participants what they would spend a certain amount of company money on. Everybody writes down their own ideas individually at first, then share them with the rest of the team. The workshop starts with a small amount, say $100. People write down their ideas, then we go to bigger and bigger amounts, $10,000, $100,000, millions. The small amounts help filter out ideas like beanbags or an X-box for the office. The big oes reveal what ventures people would start or other big investments they would make. In my opinion, professional coaches and organizational developers overestimate the importance of these warm-up workshops. They are fun and they help, but too many give your team the sense of having just talked about bullsh*t, not the real, important things. After one or two warm-up activities, start talking about your main topic, the hard business-related strategic questions and setting goals. Many great ways and special techniques can facilitate these discussions but those will wait for another post. In short: give people time to think about the questions themselves alone, then share their findings, group the ideas, and discuss these results in detail one-by-one. Vote when you need to narrow the scope. In the end, you should have a clear plan, so when you go home, your team will feel ready to execute it. 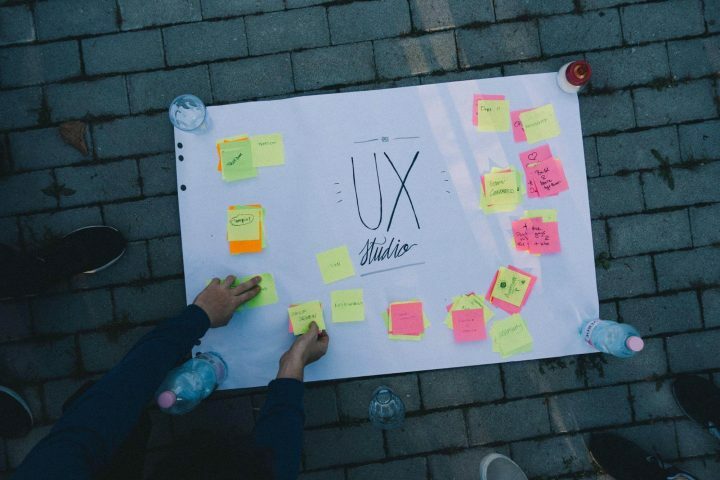 Want to know more about the UX process? Download our free ebook Product Manager’s Guide To UX Design! At the end of the retreat, leaders should stand before the team and summarize the results. They should show their excitement about the plans and the future. 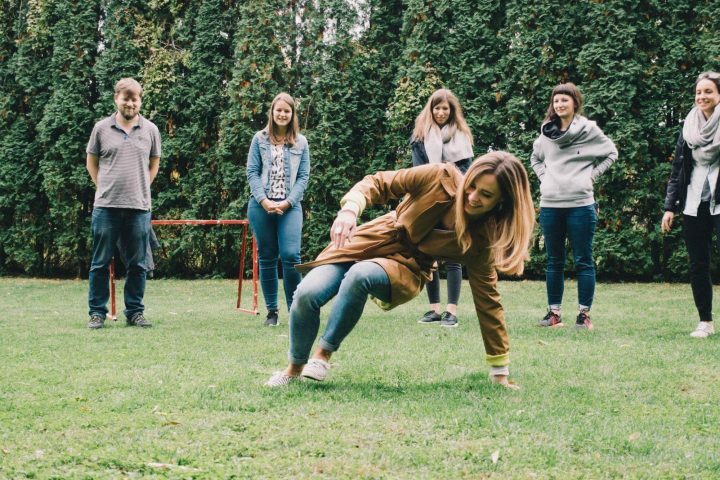 Close the team retreat with fun activities to relieve tension and process all the things that happened. Fun activities to break the ice, relax and distance ourselves from daily work. Warm-up workshops to understand team identity and think about the long-term. Serious discussions, the main topics of the retreat, discussing questions, making decisions, crafting plans. Closing fun activities where leaders summarize the results and we have some fun together to chill out before we leave. 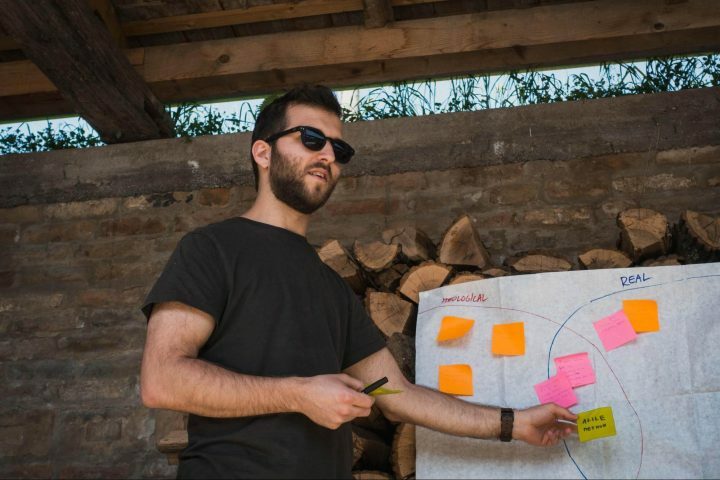 During our last retreat, we made the mistake not clarifying for everyone how the results of one workshop would form the input for the next. Make sure the whole team understands the agenda, that they know what will happen and why we do certain things. Many differences will arise doing a retreat with a small five-to-ten-person team, or a larger one of 15-25. A small team usually has just one track of activities. Finding out what the team likes to do comes easier, as do on-the-spot adjustments to the agenda. Things will need changing on the go anyway. 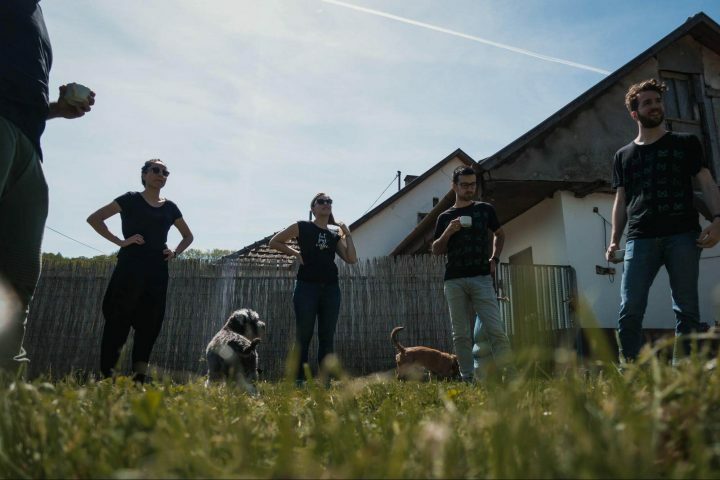 When only eight or ten of us made up UX studio, we had a great retreat in a house we rented on the countryside. Suddenly, a topic came up out of nowhere that caused a lot of tension. It turned out nearly everyone feared growth. They loved the company and felt if we grew bigger, they would lose this friendly atmosphere and their impact. In this case, I had to cancel many planned discussions and spend the majority of the time resolving this topic. Although we didn’t follow our original agenda, we solved this important question and prepared everyone for potential growth. Cooking together for ourselves really works well for small groups. Everyone can participate, and it creates real teamwork. Of course, after a while it just does not work so well. The time our small eight-person team feared has finally come: we now comprise 30 people. 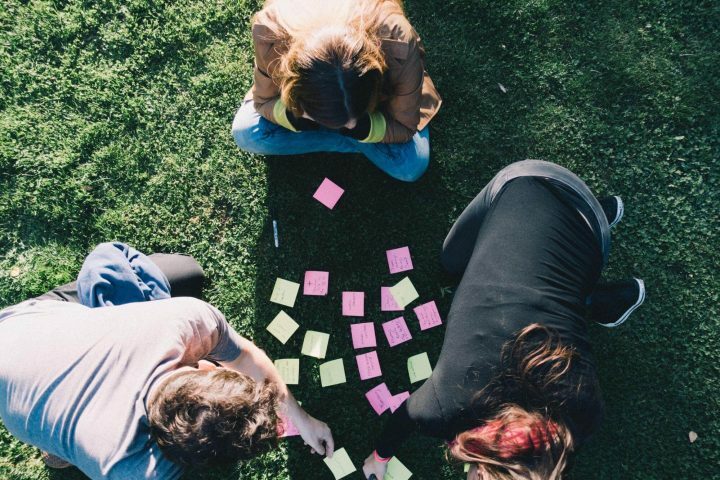 As the team grows, facilitating discussions has become more and more difficult. A group of more than eight makes it impossible to sit in a room and talk about a topic. That requires different workshop techniques, like dividing people into smaller groups, merging and grouping findings, voting, etc. In bigger teams, people will have different idea about fun, too. Some like to party and drink; others stay sober and play cards silently in the corner. Not everyone cares about every topic you want to discuss. Mandatory participation creates a bad atmosphere. So, this year we changed our team building retreat organizational strategy. We now have three tracks going simultaneously, all of which optional. We provide multiple options even for fun activities. Everyone can choose theirs, even to just chill in the sun. We also made sure not to fill our agenda too densely, ensuring plenty of free time. See the image of our last retreat’s agenda below. You can also access it in editable form here. One more great tip for the end: People will get more involved in activities they organize themselves. A different team member organizes each fun or serious activity we do on retreat. Niki, our finance manager, handles the travel, venue and catering. One person puts the agenda together, then several team members choose single activities to run. The main organizer helps them prepare and makes sure everything goes well. All in all, retreats provide a great opportunity to bond with peers, have fun, and discuss important topics about your business and product. Go out of town and spend at least two nights. Value fun activities as much as serious discussions. Fun activities first, then warm-up workshops, serious discussion, leader’s summary, closing fun. With smaller teams, be prepared to change things on the spot. Involve people in the preparation and organization of different activities. Thanks for reading. I hope it will help. If you decide to finally start organizing retreats, I wish you lots of fun! If you are already doing them, I hope you got some good insights. If you have any questions, let me know in the comment section below! In the mood to read some more? I also wrote an actual hardcover Product Design book about how I see design and user experience, as well as our process. Order it now! We have quite a few other articles about management. For example, the one about leadership, the one about product management tools or building a design culture. Also, make sure to follow our blog with Bloglovin! Previous articleLearn – How Image Optimization Improve SEO & Experience for websites?